You can find a complete 2013 Nissan Titan review below the video. Good Titan reviews are hard to find; let the premier Nissan retailer in Albuquerque put it all in one location for you. All of the things you need to know about the Nissan Titan are right here in this article. Each passage is crammed with practical info and Titan details. Good luck in your search! 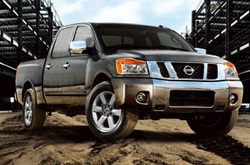 Comparing the 2013 Nissan Titan alongside against vehicles like the 2013 Chevy Silverado, Dodge Ram 1500 and the Ford F-150, and you will notice that the 2013 Titan scores higher the competition in several areas. Browse our bullets to see why! 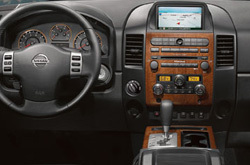 See inside the 2013 Nissan Titan - view video here! Your Nissan deserves to be treated correctly - that means Nissan factory- trained Titan technicians, the reassurance that comes from a 1 year service work warranty and accredited Nissan Titan parts. Reliable Nissan service and Nissan repair in Albuquerque is a double click away! The well-versed technicians at our Nissan repair division in Albuquerque will help your Titan run problem free. For standard oil changes and other Nissan services like tire alignment and checkups and battery replacement, come to us. We even manage more elaborate duties with without breaking a sweat, including jobs like muffler repair. Make a judicious choice when selecting a spot to have your Nissan Titan repaired, and consider this: At Reliable Nissan you can always get awesome service and inexpensive prices on Albuquerque car repair. To search for unbelievable service coupons, click the link below this text right this instant!